I love books about books, so when I started seeing reviews of this book around the blogosphere, I knew I was going to have to read it. Helene Hanff is frustrated by the books available in American bookstores, so when she sees an advertisement for Marks & Co. in a magazine she decides to try her luck overseas. She writes a letter to the bookstore telling of her wishes. This letter starts a friendship that will play out for years. The letters are almost always answered by Frank Doel, but while her letters are very informal and often humourous; he has a bit more restraint. This was a charming little book. It is told through letters both between Helene and Frank, but also with other employees of the store, Frank's wife, and other friends of Helene making occasional appearances. If you haven't read this book yet, I strongly recommend it. Reason for Reading: Sequel to 84, Charing Cross Road. A zesty memoir of the celebrated writer's travels to England where she meets the cherished friends from 84, Charing Cross Road. Over the years of correspondence in the first book, Helene often speaks of visiting England and meeting the people that have kept her in books for many years. There is always something that comes up that prevents her from doing so, though. Then, Frank dies and it seems she has left things much too late. She always promised to visit, though, so she has finally made her trip to England. At this point she has published her famous book and it is it that largely plays a roll in her finally getting the chance. The first book is told through letters, but this one is told through journal entries. She seems like such a fun person and she really comes to life through this book. It is a bittersweet journey, but she makes the best of it and visits all the places she has dreamed of for years. This book could also be seen as a travelogue. Reason for Watching: The library actually had a copy. It was fun to see the events of the book played out in a movie format. Anne Bancroft plays Helene and Anthony Hopkins plays Frank. It was a charming movie that I watched last night. I think Anne and Anthony did a really good job bringing the two characters to life. I also was impressed by how well the movie followed the book. The characters actually read the letters aloud, so they continue to play a large role. I enjoyed the movie and think I am going to see about getting a copy of both the movie and the two books of my own. Have you read the books before? What did you think? If you have seen the movie, do you think it was faithful to the book? I had no idea it was a movie! I've been wanting to read the book for awhile now. Glad you enjoyed it. fascinating. I had no idea that there was a sequel! --course, I only recently learned about the book and film. they sound lovely. I'd love to see the movie! I've read the first book (and loved it!) and I saw the movie. The second book has been on my TBR shelf for quite awhile, but I was so worried it would be disappointing. I think I'll have to check it out. Wow! 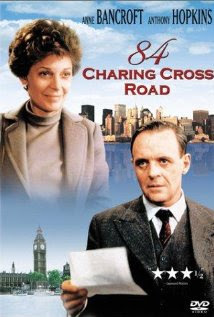 Anne Bancroft and Anthony Hopkins look so young on the cover of the movie!! I haven't read this one yet and somehow missed that it was about books! Definitely has my interest now. I just recently read 84, Charing Cross Road and adored it. I borrowed it from the library but now I want to own a good hardcover copy of it. I need to get the follow up book from the library soon. Then I can watch the movie. I can totally see Anthony Hopkins as Frank. I tried the movie earlier this year and just couldn't get into it. I still want to read the book though! I've got to get my mitts on that sequel. You already know I loved 84 Charing Cross Road and the movie. So glad you were able to watch the movie so soon after reading the books! This was such a fun post. Loved reading your thoughts on all three! I've been wanting to read 84, Charing Cross ever since I read The Guernsey Literary and Potato Peel Pie Society. I had no idea there is a movie too. I read the first book and loved it. I don't really get her taste in books but i loved her enthusiasm. I have the movie ready to watch. 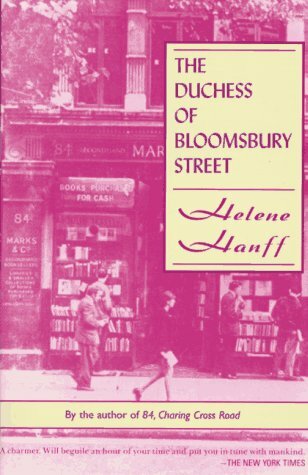 Duchess of Bloomsbury has been on my reading list since then. I just haven't gotten around to reading it yet, or seeing the movie. I loved the books but I haven't seen the movie. I'm glad to hear that it stuck so closely to the book - that was part of my concern. **Anna: It was a pretty good movie and book. I hope you enjoy it! **L: The library had the sequel or I might never have known either. **jenclair: I was very surprised my library had it! **Melissa: It was different, but the second book was fun. **Trish: Yes, it was 1987! They were pretty young back then. **Amused: It stayed pretty close to the book. **SuziQoregon: I want to own it, too. It was a good read. Anthony Hopkins was really good as Frank. I thought he did a good job. **Bookfool: I hope you do get a chance to read the sequel! Thanks for telling me about the movie. The triple experience was fun! **bermudaonion: Yes, it came out in 1987. **Caroline: I didn't really have any interest in her choice of books either. **jehara: It was too short! **Alyce: The movie was pretty good. I think it captured the book very well. I read - and adored - 84 Charing Cross Road, but have yet to read the sequel or watch the movie. Sounds like I should do that soon! **Carrie: It is a good idea! 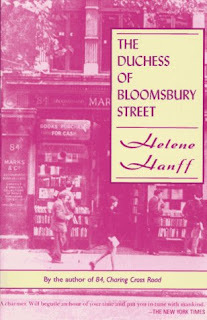 How nice that you read 84, Charing Cross Road, her memoir, then watched the film. I've never heard of this before. Anthony Hopkins looks so young! I remember watching this move sometime in the early '90s and absolutely loved it. Anthony Hopkins and Anne Bancroft were perfect for the roles, but I never realized at the time that it was based on a book, and a true story at that. Years later, when I learned that the characters were real people, I was so sad that Frank had died before she got a chance to meet him. I've been meaning to read these books, so thanks for reminding me about them! I saw the movie first, years and years ago and only recently realized it was based on a book. Meanwhile I've read both of the books and even passed by 84 CHaring Cross on a visit to London. Unfortunately the bookstore is no longer there but there's a lovely plaque remembering it instead. I love these books. They're so heartwarming, and I love it when Helene gets to go to London and see all the things that I love. Aw. I need to reread these, and then see the movie. Is it on Netflix perchance? 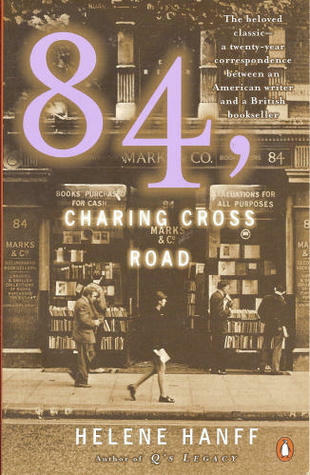 I loved 84 Charing Cross Road! I didn't know about the sequel and I haven't seen the movie. Looks like more fun in store for me! Speaking about books about books, I've just picked up Ex Libris by Anne Fadiman and am looking forward to it. I must have missed the buzz on either of these, but they both sound absolutely charming! Epistolary novels are so much fun. **naida: It was a fun experience! I recommend it if you decide to read the books. The movie came out in 1987, so he was relatively young at the time. **Natalie: I was sad that Frank died before she made it to England, too! **Alex: I would love to pass by the bookstore. One of these days! It is sad the bookstore is gone, but at least there is a plaque. **Terri: I hope you enjoy both the sequel and the movie! Ex Libris was really good. I must see if the library ever got around to buying the sequel. Enjoy! **Michelle: I have noticed they have been getting a lot of attention this year. It's fun when older books resurface to lots of attention.